Posted by Laxmi Goutham Vulpala in case studies, MBA. 1.1 Industry Description:Telecom industry comprises the firms in business transmission of voice and data between devices. Voice and data are encoded and decoded into electrical signals after transmission and before reaching the destination. The signals are then transmitted over a network of copper/fiber-optic cable. The significance of this industry can be judged from the enormous amount of the revenues it generates. In 2005 the total revenues across the world in this industry to amounted 1.2 trillion 6 [VoIP Magazine, 2005 ] which is almost 3% of the world GDP. In the US, Voice business amounts to 64.9% of the business while Data and other services take the rest of the market 5 [Exhibit 2]. However due to recent advances in technology the share of data has been increasing rapidly High speed internet is rapidly making a way into households and is poised to become the leading revenue earner for the firms in the industry. Most of the firms in the business have one or more four distinct lines of business, 1) Voice services 2) Wireless voice/data services and 3) Internet/ Broadband/Data services and more recently 4) Video services. Until the early 90’s the industry was compromised of monopoly regional operators strictly regulated by the Federal Communication Commission (FCC) and the state public utility commissions. The firms who wanted to enter the business in this industry needed the licenses from FCC. The monopolistic nature of these corporations meant price controls were imposed any price rises were decided by the regulatory bodies upon requests by businesses citing increased expenses. 1.2 Forces Driving Change Several changes occurred in the industry in the mid nineties, which altered the structure of the industry and continue to have an effect on the industry structure today. 1.2.2 Technological Breakthroughs: The new technological breakthroughs and availability of technologies for mass deployment in the late 90’s like fiber optic cables, Internet Telephony (VoIP) and Wireless brought significant changes in the industry. The new technologies altered consumer behaviors and provided significant impetus to innovation and in turn caused several new firms to enter the industry. The cost structure of the new entrants was significantly less than the existing firms. This led to increased competition and fall in margins in across the industry. 1.2.3 Decline of Voice Services / Growth in Data Services: The availability of choices and better alternatives for consumers has diminished the importance of voice services especially for the younger demographic. Competition drove the price voice prices down, At the same time consumer spending on broadband grew rapidly driven mostly by the rapid growth of content rich data ,applications like music, video and gaming. 1.3 Porter’s Five Forces Analysis: The different factors having an impact on the telecom industry can be analyzed using Porters five forces framework. The result of this analysis, showing the strength of each force is tabulated in Exhibit 3. 1.3.1 Threat of Entry: Prior to Mid-nineties, entry into fixed line telecom business was very difficult owing to several factors, Firstly it was a very capital intensive industry, entry into this industry meant that the firms needed access to huge amount of capital mainly to cover the fixed costs to lay and maintain a physical network (exchanges, fiber optic cables etc) to the premises of customers. In addition to that firms needed to get regulatory approval/licenses from the Federal Communications Commission (FCC), which was both costly, and a tedious affair. Hence the companies in this industry mostly tended to monopolies strictly regulated by the government subject to price controls and moderate to heavy taxation. Deregulation and the telecom act of 1996 provided a significant reduction in barriers as the new entrants did not need to own their networks.The technological changes also provided impetus to the significant reduction of barriers; Internet Telephony provided a way for several firms to enter the market and compete with the incumbents without the significant upfront fixed costs. One of the notable entrants into the business is Vonage, this firm began offering its version of IP telephony product since 2003. The entry of new progressively become very easy, in fact it has become so easy that there are company’s like RTC Factory claim to provide services that can let firms start their own branded fixed line IP telephony voice business within 6-8 weeks in 10 easy steps. 1.3.2 Supplier Power: The Suppliers in this industry are the manufacturers of telephone switching /switch board equipment, fiber optic cables, network equipment, and billing software makers. The prominent names in this industry include Cisco, Alcatel-lucent, Nokia, Nortel, Motorola and Tellabs etcAfter the deregulation of downstream service providers and the technological breakthrough in IP networks, Telecom equipment makers began to ramp up manufacturing in order to meet the huge anticipated demand, however aftermath the dot com bubble, demand did not pan out as expected and led to overcapacity and eventually demise of several firms. The evidence of decline can be gauged from the fact that the telecommunications industry Association (TIA) reported that in 2001, a cumulative decline of $30.5 billion in revenues4 [Encyclopedia of American Industries]. With excess capacity and falling demand, the suppliers have do not have the power and clout to negotiate with the telecom behemoths. However with the demand in recent years has started to pick up with fixed line providers deciding to install fiber based networks to provide faster data and video services. 1.3.3 Power of Buyers: With increased choice of several technologies and means of communication available and entrance of several new firms buyer power is been increasing. The consumer now has access to several means of communication like email, instant messaging which are diminishing the importance voice services. Residential consumer also benefits with local number portability (A regulation from FCC which mandates the carriers to move the phone number when the customer switches to a different carrier). This feature makes switching costs negligible. The business segment however is prone to significant switching costs as they rely on more customized products which are tailored to their businesses and most times are locked into long-term contracts. 1.3.4 Threat of Substitutes: Several substitute products and services have emerged to fixed line telephones as a result of technological breakthroughs. Some of these are more convenient and offer far greater value to the consumer and have diminished the importance of fixed line phones. Substitutes include IP Telephony, Mobile phones, Satellite, Email, and Instant Messaging etc. Among the several substitutes that have emerged, IP telephony has emerged as the biggest threat. Applications like Skype have been extremely popular among younger generation users and are fast emerging as preferred means of communication.Wireless phones are also getting cheaper each year over the last decade; this has provided consumers with more convenience and mobility, to the extent that the younger demographic now considers a fixed line phone redundant. 1.3.5 Industry Rivalry: Industry rivalry has become extremely intense with the emergence of new competing firms leading to price cuts across the industry. Voice offerings are turning into commodities with the business going to lowest cost provider. 1.4.1 Bundling: Consumers value convenience more than anything else. A company’s ability to provide multiple services like wireline / wireless/ high speed internet / video at an attractive price not only provides value to the consumer but also helps the company’s bottom-line due to reduced customer acquisition costs. It also is widely believed in the telecom industry and supported by the data, that churn reduces drastically for customers subscribed to a bundle as a result of increased switching costs. 1.4.2 Network Quality: One of the key difference between the old generation PSTN (public switched telephone network) used by telecom companies versus the new generation IP networks used by both the cable providers and VoIP providers is the ability to receive phone calls on the PSTN networks when the power is out. There is difference in quality of the voice transmitted, however the gap is closing fast .1.4.3 Economies of scale: Telecom is a huge fixed cost business; most of the costs go into installing and maintaining the network. The marginal cost of adding a new customer is very small. As a result, Providers with large subscriber bases enjoy a significant advantage over the smaller ones. 1.4.4 Customer Service: In this industry, although the customer contact with the firm is minimal, it is very critical and can define customer experience. Customer mostly comes into contact with the employees of the firm only during installation and service outages, the expectation of the customer is that the service be always available and the problems be immediately fixed. 1.4.5 Brand Name: Brand Name plays an important role for the customer choosing the service. In this Industry Bell and Cable companies have been able to build brand recognition over time, VoIP entrant however have to spend significant amount of money in advertising to be able to counter these strong brand names. 1.4.6 Retail Presence: Wireless phone industry has required retail presence from traditional telecoms mainly to display and sell wireless devices, this presence has helped them with customer as they were more accessible to the customers and provided a new medium of distribution for all services, Cable and VoIP firms however have to depend on electronic retailers. 1.4.8 Convergence: Convergence is the ability for customers to access any data seamlessly without restrictions and the networks and the devices to get to that data. In future the success of the telecom companies is dependent on how effectively they can provide converged services. 1.4.9 Partnerships: Diversity of services this industry makes it difficult for a service provider to be good at everything, so the crucial thing for a firm in this industry is to be able to forge partnerships to be able to provide what customers need. Why Birds Eye developed as a vertically integrated producer:The following are chiefly the reasons why Birds Eye developed as a vertically integrated producer. · Undeveloped Infrastructure: The frozen food market during 50’s and early 60’s was in its infancy with the raw material suppliers, distributors and retail stores relatively unsophisticated. The infrastructure needed to support the business was not fully developed. For the raw materials (peas), farmers needed help with investments in harvesting equipment and with farming expertise. In the distribution, retailers needed financing help with the purchases of refrigerators. In such scenario, it made sense for Birds Eye to both forward and backward integrate as it had the both the capabilities and resources to manage the entire supply chain.· Rapid Growth: During the 1950’s and 60’s the tonnage sales were increasing at a rapid rate of 40% per annum. During such remarkable growth periods it makes sense for companies to vertically integrate so as to secure the raw materials, ramp up distribution and production capacities in order to keep up with the demand. · Prevent new competition: Owning the entire value chain meant that, entering into this market would become significantly difficult for new entrants due to high capital needs.· Industry Structure: The two main competitors of Birds Eye during 50’s and 60’s Ross and Findus were also following the vertical integration strategy and the industry structure and maturity around this time forced the businesses to vertically integrate as they had no other choice. Birds Eye’s different arrangements for peas, fish & meat:For fish and poultry Birds Eye did backward integration by building capacity and acquiring controlling stake in the suppliers. For vegetables however they worked closely with the farmers providing them with both capital and expertise with the growth of high quality produce. Both the models allowed Birds Eye to have a tight control over it supply chain. The reason for the difference can probably be explained by the fact that in the vegetable market Birds Eye was able to secure the supply of raw materials with longer-term contracts with the farmers, However with the fish supplies, there process was more adhoc where the supplies were either bought from dock side auctions are imported from Scandinavia. This process did not let Birds Eye have enough control so they fixed the process by vertical integration. · Industry Maturity/ Technological breakthroughs: As the industry matured the rate of technological breakthroughs increased which led to decrease in the amount of capital to enter the business making the barriers to entry low. The emergence of smaller firms opened up opportunities to offer specialized services to manage the various functions in frozen food retail.· Supermarket Chains: Development in the food retailing led to the emergence of super market chains this development led to shift in the balance of power from producers to retailers. Retailers found it profitable to introduce their own brands in the market. This led to an increase of market shares of retailers own brands from 0 to 29% in 1982 (Exhibit 2), these retailers whose core business was not frozen food needed some one to manage distribution and production facilities this paved the way for the emergence of specialized intermediaries. · Catering Segment: Percent consumption of catering companies increased from 16% in 1967 to 30% in 1973 (Exhibit 1b). Birds Eye did not cater to this niche market whose requirements were different from the consumer market in the sense that they need larger packaging sizes at a lower cost. These factors led to the emergence of competitors like Menu master Ltd to cater to this segment. The new entrants required help with the distribution and production, which again stimulated the emergence of specialized intermediaries like Flying Goose, which specialized in this segment.· Specialization: As the industry and the cost structures decreased, it made sense for the new entrants to specialize in one product business to reduce costs and complexity in business. Exhibit 7 shows, several new entrants into the market who specialized in one single product with market shares ranging between 1 to 10%. The size of these new entrants led to emergence of these market intermediaries to provide cost synergies in the scattered market place. Did a vertically integrated producer have a competitive advantage over more vertically specialized suppliers of frozen food during the early 1980s?Although vertically integrated producer did enjoy some competitive advantages relative to the specialized suppliers, but over time their structure led to some disadvantages in other areas, which negated their advantages. On the whole the disadvantages exceeded the advantages. Their advantages include:· Control over the supply chain: A vertically integrated producer enjoyed control over the entire supply chain leading to faster reaction to increased demand. · Quality of products: Since a vertically integrated producer has much better control over the quality at several points in the supply chain, they can ensure a better quality finished product.· Capturing the profit margins across the value chain: Vertically integrated producers were able to capture both the upstream and downstream profits. Disadvantages:· Increased overhead costs: The specialized suppliers enjoyed lower overhead costs as they were specialized in single product, which did not involve any changeover costs. On the other side vertically integrated suppliers had multiple product lines, which led to inefficiencies. · Selling to private labels: Birds Eye should consider selling to private labels as their share in the market place has been increasing at a rapid rate. From 6% in 1970 to 21% in 1978 (Exhibit 2). Though the margin will be lower in this business it will help recapture market share. · Reduce product lines: Over a period of time product proliferation occurred at Birds Eye in order to compete in several different market segments. This led to difficulties with marketing as promoting such widely different products was proving to be difficult. Birds Eye should consider concentrating on the most profitable product lines, use it s brand image as leverage and promote higher margin products while doing away with the unprofitable product lines. Posted by Laxmi Goutham Vulpala in case studies. Soft drink industry is very profitable, more so for the concentrate producers than the bottler’s. This is surprising considering the fact that product sold is a commodity which can even be produced easily. There are several reasons for this, using the five forces analysis we can clearly demonstrate how each force contributes the profitability of the industry. Bottling Network: Both Coke and PepsiCo have franchisee agreements with their existing bottler’s who have rights in a certain geographic area in perpetuity. These agreements prohibit bottler’s from taking on new competing brands for similar products. Also with the recent consolidation among the bottler’s and the backward integration with both Coke and Pepsi buying significant percent of bottling companies, it is very difficult for a firm entering to find bottler’s willing to distribute their product. The other approach to try and build their bottling plants would be very capital-intensive effort with new efficient plant capital requirements in 1998 being $75 million. Advertising Spend: The advertising and marketing spend (Case Exhibit 5 & 6) in the industry is in 2000 was around $ 2.6 billion (0.40 per case * 6.6 billion cases) mainly by Coke, Pepsi and their bottler’s. The average advertisement spending per point of market share in 2000 was 8.3 million (Exhibit 2). This makes it extremely difficult for an entrant to compete with the incumbents and gain any visibility. Brand Image / Loyalty: Coke and Pepsi have a long history of heavy advertising and this has earned them huge amount of brand equity and loyal customer’s all over the world. This makes it virtually impossible for a new entrant to match this scale in this market place. Retailer Shelf Space (Retail Distribution): Retailers enjoy significant margins of 15-20% on these soft drinks for the shelf space they offer. These margins are quite significant for their bottom-line. This makes it tough for the new entrants to convince retailers to carry/substitute their new products for Coke and Pepsi. Fear of Retaliation: To enter into a market with entrenched rival behemoths like Pepsi and Coke is not easy as it could lead to price wars which affect the new comer. Commodity Ingredients: Most of the raw materials needed to produce concentrate are basic commodities like Color, flavor, caffeine or additives, sugar, packaging. Essentially these are basic commodities. The producers of these products have no power over the pricing hence the suppliers in this industry are weak. The major channels for the Soft Drink industry (Exhibit 6) are food stores, Fast food fountain, vending, convenience stores and others in the order of market share. The profitability in each of these segments clearly illustrate the buyer power and how different buyers pay different prices based on their power to negotiate. Convenience Stores: This segment of buyer’s is extremely fragmented and hence have to pay higher prices, NOPBT here is $0.69 /case. Fountain: This segment of buyer’s are the least profitable because of their large amount of purchases hey make, It allows them to have freedom to negotiate. Coke and Pepsi primarily consider this segment “Paid Sampling” with low margins. NOPBT in this segment is $0.09 /case. Vending: This channel serves the customer’s directly with absolutely no power with the buyer, hence NOPBT of $0.97/case. The Concentrate Producer industry can be classified as a Duopoly with Pepsi and Coke as the firms competing. The market share of the rest of the competition is too small to cause any upheaval of pricing or industry structure. Pepsi and Coke mainly over the years competed on differentiation and advertising rather than on pricing except for a period in the 1990’s. This prevented a huge dent in profits. Pricing wars are however a feature in their international expansion strategies. With the decrease in the number of bottler’s from 2000 in 1970 to less than 300 in 2000, the concentrate producers were concerned about the bottler’s clout and started acquiring stakes in the bottling business. They could offer attractive packaging to the end consumer. To preempt new competition from entering business if they control the bottling. During the 1960’s and 70’s Coke and Pepsi concentrated on a differentiation and advertising strategy. The “Pepsi Challenge” in 1974 was a prime example of this strategy where blind taste tests were hosted by Pepsi in order to differentiate itself as a better tasting product from Coke. However during the early 1990’s bottler’s of Coke and Pepsi employed low priced strategies in the supermarket channel in order to compete with store brands, This had a negative effect on the profitability of the bottlers. Net profit as a percentage of sales for bottlers during this period was in the low single digits (-2.1-2.9% Exhibit 4) Pepsi and Coke were however able to maintain the profitability through sustained growth in Frito Lay and International sales respectively. The bottling companies however in the late 90’s decided to abandon the price war, which was not doing industry any good by raising the prices. Coke was more successful internationally compared to Pepsi due to its early lead as Pepsi had failed to concentrate on its international business after the world war and prior to the 70’s. Pepsi however sought to correct this mistake by entering emerging markets where it was not at a competitive disadvantage with respect to Coke as it failed to make any heady way in the European market. 4. Can Coke and Pepsi sustain their profits in the wake of flattening demand and growing popularity of non-carbonated drinks? This industry does not have a great deal of threat from disruptive forces in technology. Coke and Pepsi have been in the business long enough to accumulate great amount of brand equity which can sustain them for a long time and allow them to use the brand equity when they diversify their business more easily by leveraging the brand. Per capita consumption in the emerging economies is very small compared to the US market so there is huge potential for growth. Coke and Pepsi can diversify into non–carbonated drinks to counter the flattening demand in the carbonated drinks. This will provide diversification options and provide an opportunity to grow. Globalization provides Coke and Pepsi with both unique challenges as well as opportunities at the same time. To certain extent globalization has changed the industry structure because of the following factors. Rivalry Intensity: Coke has been more dominant (53% of market share in 1999). in the international market compared to Pepsi (21% of market share in 1999) This can be attributed to the fact that it took advantage of Pepsi entering the markets late and has set up its bottler’s and distribution networks especially in developed markets. This has put Pepsi at a significant disadvantage compared to the US Market. Pepsi is however trying to counter this by competing more aggressively in the emerging economies where the dominance of Coke is not as pronounced, With the growth in emerging markets significantly expected to exceed the developed markets the rivalry internationally is going to be more pronounced. Barriers to Entry: Barriers to entry are not as strong in emerging markets and it will be more challenging to Coke and Pepsi, where they would have to deal with regulatory challenges, cultural and any existing competition who have their distribution networks already setup. The will lack the clout that have with the bottler’s in the US. Substitutes: Since many of the markets are culturally very different and vast numbers of substitutes are available, added to the fact that carbonated products are not the first choices to quench thirst in these cultures present additional significant challenges. The consumption is very low in the emerging markets is miniscule compared to the US market. A lot more money would have to be spent on advertising to get people used the carbonated drinks. In this documentary Nokia finds itself in a very interesting position. After being included in an Ethical Mutual fund, Nokia’s executives want some introspection done by asking the question “Are we really Ethical?” They then decide to send an audit team to find the results at one of their suppliers. The struggle is clearly evident right at the beginning of the documentary when the question is turned into if they want to be really ethical or if all they are doing is a PR exercise to appear ethical? When multinationals are operating business and have suppliers all over the word whose standards for ethics apply? In the globalized world where suppliers have their own suppliers How far in the supply chain is the company responsible for as far as enforcing ethical behavior is concerned? If the standards of developed countries are enforced on suppliers in developing countries then would it be considered imposition of cultural values one country over the other? What I like about this film is the way it provides an unique glimpse into working conditions in Chinese factories where most of the manufacturing work is outsourced these days. It also provides an interesting perspective on ethics by highlighting the grey areas in the factory without passing judgments. It is very successful in showing the problems facing companies in the today’s globalized world where they are being held responsible for the ethics of their entire supply chain. I thought film could have been better if it had been able to provide a human touch to the whole thing by providing factory worker’s perspective on the issues that the Nokia consultant and employee are concerned about and the recommendations they make to the supplier. The question of how important those issues were from a worker’s perspective would have been very interesting. The film shows how difficult and challenging it is to manage a global supply chain and at the same time be able to manage ethical concerns and issues with the suppliers, given little flexibility operationally to be able to change or push suppliers to do the right things. It provides a perspective to not look at problems highlighted in the documentary such as non payment of minimum wages, conditions at work places, working hours etc from a narrow prism of right or wrong or as black and white decisions, but rather go beyond the superficial facts, try and digger deeper into the issues, and see why a certain thing is being done the way its currently, as most of these fall into the grey area and come up with the solution that is right for all the parties and is the most ethical thing to do. Lastly it provides lessons in cultural sensitivity and shows how important things in one culture do not evoke the same response from other cultures. Posted by Laxmi Goutham Vulpala in Life in general, MBA. Finally the fall quarter ended, this quarter it was quite hectic compared to the previous ones. Financial Accounting was a tough one, Learnt lots of stuff about financial statments and various financial metrics. I thought it was the second best so far (after Economics for Managers). The exams both the midterm and the final especially the midterm were the toughest so far. I managed a ‘B’ and I am not sad, Professor doesnt give out A-‘s and B+’s so for me going into the final there was no chance for me to get an A so I took it easy. Marketing was pretty cool, it was an easy ‘A’, learnt a few interesting concepts like Consumer Behaviour, Social Influencing strategies. Had lots of case presentations in the course. Over all the learning in this course was not very high. Next quarter starts on Jan 3, but before that I have to prepare for my PMP exam. Posted by Laxmi Goutham Vulpala in MBA. Recently there was a question on my marketing take home exam about Apple’s new iPod ad where the product name was not mentioned and if it was a good idea. These ads by Apple were very impressive and campaign was very successful. These kinds of ads do work, but only in situations when large enough critical mass of people know about the product, and the ad image been “branded” into the consciousness of consumers. These ads are built on top of prior similar successful campaigns, (in which the brand and product are mentioned ) which created the brand image for the product. 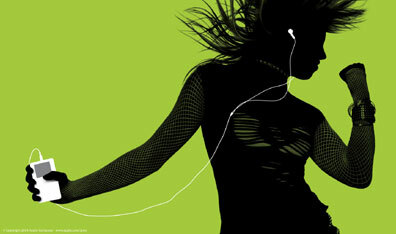 This specific campaign where the names were not mentioned was started by Apple on the back of a very successful “iPod Silhouettes” campaign, which helped build iPod a brand recognition of a cool device, that every music lover could use. At this point after the extremely successful launch of the product, it was not important anymore to mention the product or company name, but s sufficient to just evoke the feelings about the product in the minds of consumers and this was possible without even mentioning the name of the product in the ad. Also for the folks who fail to comprehend the product from the ads it creates a kind of curiosity in their minds about what the ad is all about and helps create a mystique image around the product once they figure out what it is. Sam Walton founded Wal-Mart in 1962, when he opened a store in Rogers Arkansas after a disagreement with the board of Ben Franklin about their discounting strategy. Since then Wal-Mart has had a phenomenal growth to become the biggest retailer in the world, As of October 31, 2006, the Company had 1,100 Wal-Mart discount stores, 2,176 Supercenters, 574 Sam’s Clubs and 110 Neighborhood Markets in the United States. It also has expanded globally to almost every part of the world, and had sales of $316 billion and net income of $11.2 billion for year ending January 2006. Sam Walton’s Management style of treating employee’s as partners and associates; sharing profits and providing free flow of ideas in the initial years set the base for the growth of Wal-Mart in the later years. Their State of the art of the supply chain management system tied to all their suppliers and instant tracking of all their sales allowed them replenish the goods quickly on their shelves. By passing middlemen to allowed them to lower their cost structure, and help gain a competitive advantage. In spite of all the huge success in the domestic market, their international expansion has not been as good. Due to the cultural differences they could not successfully replicate their successes. In addition the negative publicity generated because of the jobs losses caused by expansion of Wal-Mart and their lower pay structures for their employees are causing communities to oppose their further expansion. Taking good care of the employees, and passing the value back to customers with cost-savings achieved by being frugal, will help a company immensely. Looking for and identifying underserved markets, which ignored by major companies provide new entrants with a strategy to get a foot hold in the market it provides breathing space before taking the competition to the bigger and more lucrative markets. Bad public image can create backlash against the company and even more so against the larger ones, so care needs to be taken in the initial stages and enough money spent on creating a positive image.